Just after midnight Charles Husky, the cerk at the Quik-Pik in Marshboro, North Carolina, is found lying facedown near the Slurpee machine, suffocated with Saran Wrap. For the next twenty-four hours, novelist Jill McCorkle brings us into the lives of a cast of delightful small-town characters as they sort through the facts. This book came to my attention last Christmas morning. I unwrapped a package from my husband, saw this book, and was immediately delighted. You see, Small Fry's birthday is July 7th, so I thought it was pretty cool that DH hunted down the one random novel that happened to have that very title. At the time I'd never heard of it, but I intended to save it and review it for you on (you guessed it) July 7th, in celebration of Small Fry's second birthday. Wait, book review? Okay, let's get to that. After I finished the last page, this book left me wondering how to pin down its genre. It has a little bit of everything. It's part murder mystery and part family drama. It's romantic, humorous, and introspective all at the same time. I'll admit that this could be a little disorienting, as I wondered what the author's central purpose was for much of the novel. But in the end, I think it works and it has a little something for everybody. I'd say it's especially good as a summer read, since the more serious parts are often lightened by the humorous situations and coincidences in which many of the characters find themselves. The story begins and ends with Sam Swett, a recent college graduate who hitchhikes down I-95 and ends up abandoned and drunk at a truck stop in Marshboro, North Carolina. Sam is trying to find his place in the world by observing others; this seems to be his attempt to find meaning in life, by discovering how others do so. And he certainly gets to do a lot of observing in Marshboro. At the truck stop, he witnesses a murder, and is quickly pulled into the life of this small town as its citizens attempt to figure out the identity of the culprit. The introspective, serious nature of Sam's personality is quickly levied by the quirky cast of characters that he meets in Marshboro. Granner, the 83-year-old woman celebrating her birthday, who's convinced she is being courted by a "foreigner" over the phone...Bob Bobbin, the local cop who sees himself as a real macho-Casanova...Juanita Weeks, who recently cheated on her husband but "didn't mean it"...the list goes on. All of their stories overlap over the course of this one day (July 7th) in some very odd and hilarious ways. I was impressed by McCorkle's ability to balance Sam's character with the big personalities of Marshboro's citizens. While the situations they ended up in often made me laugh, McCorkle always brings you back to Sam: how he is processing the situation, what he's learning about himself, etc. And the end of the novel wraps that up nicely, as Sam finally makes a decision about his next steps in life. Despite the silliness of some of the things that happen on July 7th, in the end, the book does make you think about finding purpose in life, the meaning of "happiness", etc. I've got to say, I was pleasantly surprised by this book. It's a lighter read that still has a thoughtful message behind it, and the author balances her characters perfectly. (Plus, who doesn't love a novel written in the 80's? Hot pink shorts, high teased hair, "going steady", Princess Diana references left and right...AMAZING. You should read it for that reason alone.) July 7th definitely makes me curious about McCorkle's other novels, and I hope to check one out soon. See, my husband had a little issue with Amazon when he ordered this for me, and he ended up getting 2 copies for the price of one. You know I'm a good book blogger when my first reaction to that was, "AWESOME, the second one can be a giveaway copy!!!!" Always thinking of you, readers. Always. 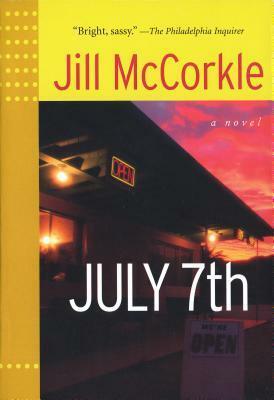 So, this giveaway is for one (used) paperback copy of July 7th by Jill McCorkle. Giveaway is open to US/Canada only, and will be open through July 17th. Use the Rafflecopter below and get entered, y'all!! A book about everything under the sun...I am totally up for that kinda read! The book "Tethered" by Amy Mackinnon is a wonderful story that takes place in my hometown. The funeral home and all of the buildings in the book are actual places in my tiny town that no one knows about. It brought a whole new element to the book that I loved, not to mention it was a great read! Oooh I love it when books take place close to my hometown. If you can picture all the specific places described, it really adds something awesome to the book! Awww Small-Fry is the cutest! I think the closest that I've read to a really personal book is a collection of short stories set around the Jersey Shore. While none of them were set in my town, I had been to many of the places that were mentioned. Small Fry is adorable, what a great pic! Happy belated birthday to him! Your husband is extra cool, what a great gift! Love the pic :) Happy birthday cutie pie! I love the premise of this book...killed by Saran Wrap!! Nope, I don't think that I have ever read a book that has some kind of connection to me like that.